JNN 03 Mar 2015 Tehran- Well-wishers hailed Iran’s nuclear negotiators as they returned to Tehran Friday from reaching a potentially historic framework deal with world powers, but Israel warned it was a “very dangerous” step. Iranians awaited the first reaction from supreme leader Ayatollah Ali Khamenei. Iran and six world powers agreed the outlines of the deal aimed at curbing Tehran’s nuclear drive on Thursday — in a major breakthrough in the 12-year standoff between Iran and the West. US President Barack Obama welcomed the “historic understanding” with the Islamic republic after decades of hostility, warning like other leaders that work remains to finalise a highly complex agreement by June 30. But in Iran — where crippling sanctions over its nuclear ambitions have left many suffering — the mood was joyful. Hundreds of Iranians took to the streets of Tehran in celebration after the agreement was announced, with drivers sounding their horns in approval along the capital’s longest street, Val-e-Asr Avenue. Arriving in Tehran from the negotiations in the Swiss city of Lausanne, Foreign Minister Mohammad Javad Zarif and his team were welcomed by dozens of well-wishers. “Viva Zarif! Viva Araghchi!” the crowd chanted, in reference to the minister and top negotiator Abbas Araghchi. In remarks at the airport, Zarif praised Khamenei for “his remarkable support for the negotiating team and his guidance” in the talks, the official IRNA news agency reported. Reaching out to Iranian hardliners who have opposed any deal that would curb Tehran’s nuclear activities, Zarif said the agreement was not finalised. “This set of solutions will be the basis for writing a final document,” he said. “We are proud because we will never surrender… but in return for the advantages that we gain, we will give things in return so we can move on,” he said. 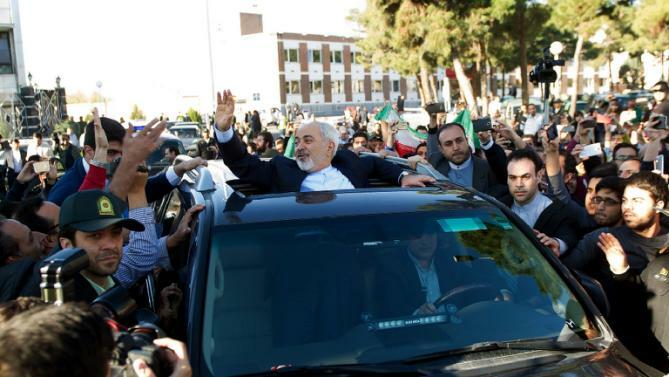 Residents lined the streets as Zarif drove away from the airport, many carrying Iranian flags, with the minister emerging from the sunroof of his car and waving to the crowd. Khamenei will have the final word on the agreement, under which Iran agreed to sharply curtail its nuclear programme in return for the lifting of sanctions. Iran’s arch-foe Israel, widely assumed to have atomic weapons of its own, slammed the outline agreement as a “historic mistake” and said it would threaten the survival of the Jewish state. Netanyahu called a meeting of his security cabinet, including ministers, as well as senior officials from Israel’s security services. Israel has repeatedly warned that it could take military action if threatened by a nuclear-armed Iran, though analysts say strikes are unlikely. Iranian President Hassan Rouhani said the drafting of a full accord was to begin immediately after Thursday’s announcement. He was to make a statement later to reporters in Tehran. Under the outline deal, the United States and the European Union are to lift all nuclear-related sanctions on Iran once the UN atomic agency has verified that Tehran has stuck to its terms. All past UN nuclear resolutions on Iran would also be lifted. The proposed limits will see Iran’s stocks of highly enriched uranium cut by 98 percent for 15 years, while its unfinished Arak reactor will not produce weapons-grade plutonium. The deal will also see Iran reduce by roughly two-thirds — to 6,104 from around 19,000 — the number of uranium centrifuges, which can make fuel for nuclear power but also the core of a nuclear bomb. The so-called P5+1 group — the United States, Britain, China, France and Russia plus Germany — hope that the deal will make it virtually impossible for Iran to make nuclear weapons. Iran, one of the world’s major oil producing countries, has always denied seeking the atomic bomb, saying its activities are for energy generation and research. France, which has taken a hawkish line during the negotiations, warned that sanctions could be reimposed if Tehran does not keep its side of the bargain. Foreign Minister Laurent Fabius said Friday that the issue of exactly when sanctions would be lifted had not yet been resolved. “The Iranians want sanctions to be lifted immediately,” Fabius told Europe 1 radio. Still, the framework agreement was widely praised. German Chancellor Angela Merkel said the international community had never “been so close to an agreement preventing Iran from having nuclear weapons”, while UN chief Ban Ki-moon said it would “contribute to peace and stability” in the Middle East. Successful implementation of the deal could put Iran and the United States on the road to better relations after 35 years of animosity since the 1979-1981 hostage crisis in Tehran. But Obama needs a deal which he can sell to hostile Republicans in Congress, who remain suspicious of Iran’s pledges and are threatening to push for new sanctions from April 14. And analysts were warning that the agreement was far from done. “This accomplishment is not final. It is as fragile as the forces against it are formidable,” Ali Vaez from the International Crisis Group told AFP. This entry was posted in America, Iran News, United States and tagged Agreement, ayatollah ali khamenei, iran, israel, Mohammad-Javad Zarif, Nuclear Deal, nuclear weapons, President Barack Obama, Swiss, Tehran, World Powers. Bookmark the permalink.